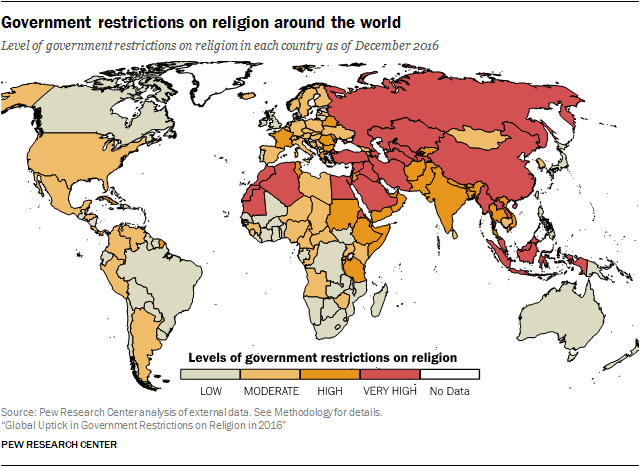 In 2016, the global median level of government restrictions on religion increased slightly to 2.8 from 2.7 in 2015. 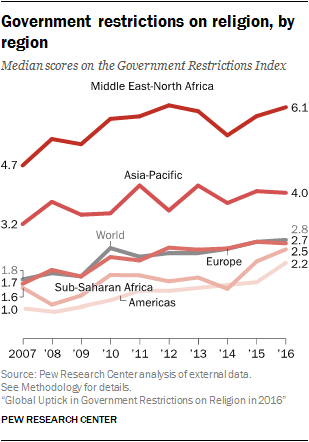 The median score rose in three out of five regions (the Americas, sub-Saharan Africa and the Middle East-North Africa region) and remained about the same in two regions (Asia-Pacific and Europe). While the Americas experienced the largest increase in its median score, it still had the lowest median score among all regions. The Middle East and North Africa continued to have the highest median level of government restrictions, with the median score for the region’s 20 countries (6.1) more than double the global median (2.8). The region’s 0.2-point increase between 2015 and 2016 was due in part to more governments displaying hostility toward minority or non-approved religious groups (from 11 countries in 2015 to 15 in 2016) and failing to protect religious groups from discrimination and abuse (up from nine to 12). The median score for Europe’s 45 countries also remained roughly unchanged in 2016, staying at 2.7.61 Continuing the trend from the previous year, government harassment and intimidation of religious groups increased from 38 to 42 European countries in 2016. 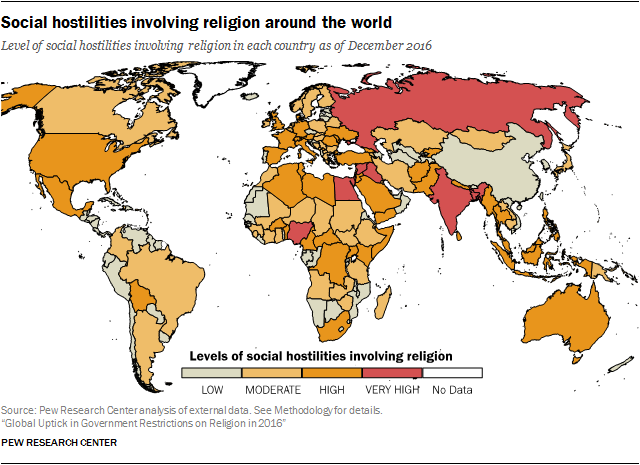 But in contrast with the previous year, the number of governments in Europe that used violence against minority religious groups declined from 10 countries to five. Similarly, government use of force against religious groups in general – whether in the form of property damage, detentions, displacements, assaults or killings – declined somewhat in 2016, from 24 to 21 countries. The Americas experienced the largest increase (0.5 points) in its median score, although this was a small change; the Americas still had the lowest levels of government restrictions of any region. 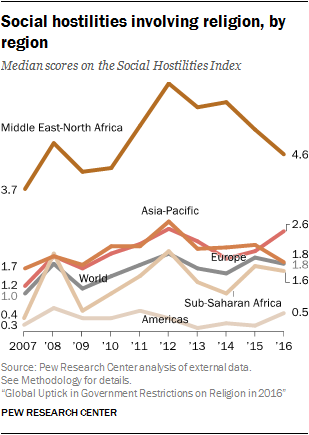 In 2016, the global median level of social hostilities decreased slightly by 0.2 points. But while scores decreased in three regions – the Asia-Pacific region, the Middle East-North Africa region and sub-Saharan Africa – they increased in Europe and the Americas. In sub-Saharan Africa, the median level of social hostilities had a very slight decrease of 0.1 points since 2015, with fewer incidents of mob violence reported in 2016.